I read this article and found it very interesting, thought it might be something for you. The article is called 4 Things That Could Change India In 2016 and is located at https://archive.indiaspend.com/cover-story/4-things-that-could-change-india-in-2016-2016. The number of Indians receiving identities from the Unique Identification Authority of India (UIDAI), or Aadhaar (foundation), will reach a billion in 2016. More than 940 million Aadhaars were generated as on 30 November 2015. By June 2015, the UIDAI had spent Rs 6,427 crore. The Supreme Court of India has allowed citizens to voluntarily use Aadhaar cards for various things: rural jobs, bank accounts, pensions, subsidised food and gas. About 120 million families will received liquified petroleum gas (LPG) subsidies directly into their bank accounts in 2016, most enabled by what is called the Aadhar Payments Bridge, an interface between banks, gas companies, UIDAI and consumers. “I expect that many more schemes will adopt the Aadhar Payments Bridge to send money, using the Aadhaar number as a financial address, into Jan Dhan (people’s wealth, a national programme to give the poorest banking access) accounts, in the same way,” Viral Shah, co-author of Rebooting India and one of Aadhaar’s architects, told IndiaSpend. Micro-ATM transactions–where social security payments are transferred to Jan Dhan accounts and cash withdrawals are made with Aadhaar biometric authentication in villages–will also “scale up in a big way”, Shah added. Aadhaar will also be the base to infuse a host of cutting-edge technologies into middle-class lives in 2016. These include e-kyc (know your customer, or banking requirements to establish customer identity), e-sign (digital signatures) and digital lockers (secure spaces on the Net to store documents). India plans to install 12 giga-watt (GW) of renewable energy by 2016, with an aim to achieve 175 GW and generate a million jobs by 2022. This 12 GW is equivalent to a third of all renewable-energy capacity installed until 30 September 2015 and will be more than double the capacity installed in 2015. India’s renewable-energy programme is one of the world’s most ambitious, and will require Rs 600,000 crore ($89.88 billion), or about four times the current defence budget, by 2022, as Factchecker.in reported. Among renewables, installed solar power capacity has reported the maximum growth, 65%, over the last 18 months, from 2.6 GW to 4.3 GW. The union ministry of human resource development has pledged to achieve 100% literacy in 410 districts under the Sansad Adarsh Gram Yojana (MPs’ Ideal Village Programme) by March 2016. India’s literacy rate increased from 18% in 1951 to 74% in 2011, but it lags other BRICS countries–their literacy rates exceed 90%–as IndiaSpend reported, with 282 million Indians illiterate. As many as 402 million Indians were supposed to be online by December 2015, a 49% jump over the previous year, overtaking the United States and becoming the world’s second largest online user base after China, according to this report, ‘Internet in India 2015’ from the Internet and Mobile Association of India (IAMAI) and IMRB International. By June 2016, 462 million Indians are expected to be online, a year-on-year growth of 36%. 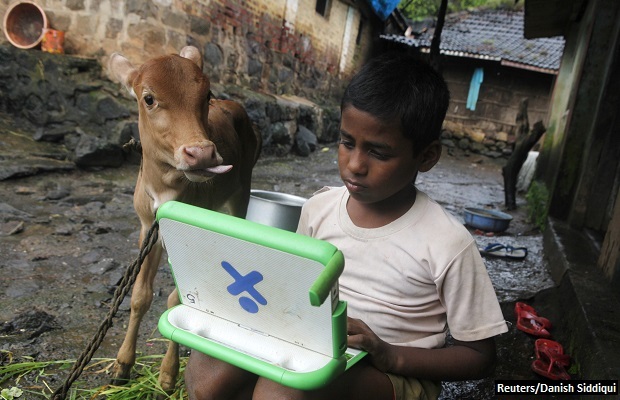 Of these, 371 million were likely to access the Net over their mobile phones. Currently, 71% of Net users in India are male and 29% female. Net use is growing 50% for male and 46% for female users. While these numbers appear impressive, India’s internet penetration–the percentage of Indians who use the Net–is low, 19% in 2014, according to this study, “India On The Go: Mobile Internet Vision 2017.” Compare this with to Australia (90%), USA (87%), Japan (86%), Brazil (53%) and China (46%). The government of India has also planned to wire 250,000 village panchayats (council areas) with broadband by December 2016. Currently, cable laying is complete in 500 villages.